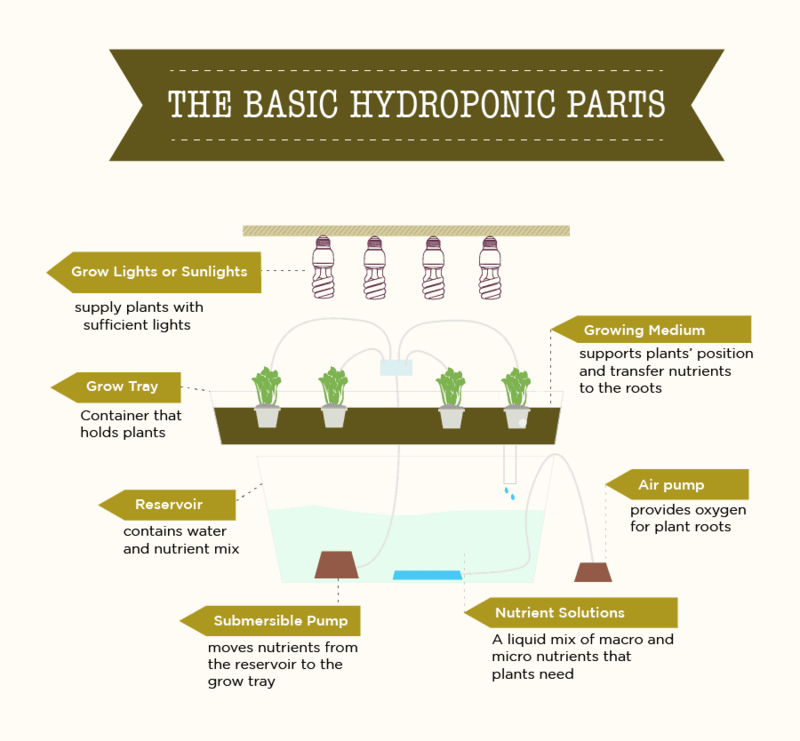 Did you know that there is not just one type of Hydroponic system? Did you know that for each system, there are also many variations of it. In this post, you'll learn how different Hydroponic systems look like, how they work, and the pros and cons of each. 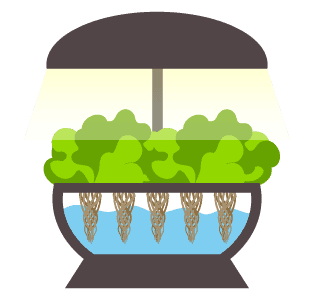 Hydroponic systems can be either active or passive. Active means that nutrient solutions will be moved, usually by a pump. Passive relies on a wick or the anchor of the growing media. Hydroponic systems are also characterized as recovery or non-recovery. Recovery means the nutrient solution will be reused into the system. Meanwhile, with non-recovery, the nutrient solution is applied to the growing media, and vanish. 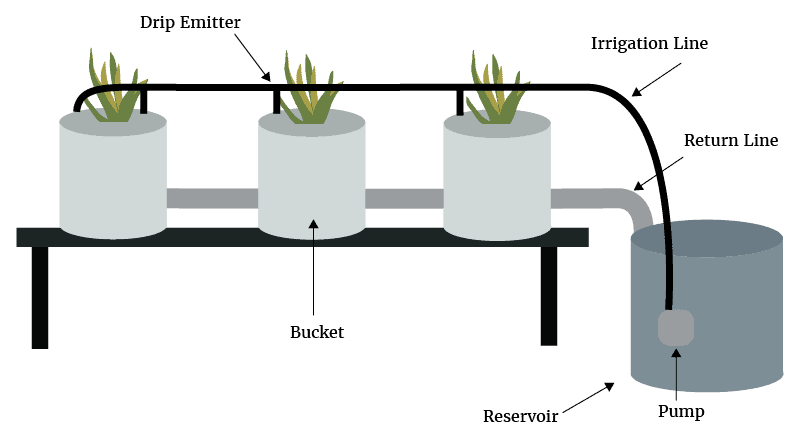 In essence, a basic Hydroponic system will look like the image on the right. There are 6 main types of hydroponic system. Meanwhile, the plant roots need 3 things, water/moisture, nutrients, and oxygen. So, what differs in the 6 methods is the way the systems deliver these 3 important things to plant roots. Of course, there are lots of variations with different names but they all boil down to these 6 core types of Hydroponic systems. You are going to learn all about them. Let's start with the Wick system. Not suitable for larger plants. Not efficient in nutrient use. The wick system works passively. It uses no pumps, and there are no moving parts. This hydroponic technique is by far the most basic type of Hydroponic system. Just like it sounds, the wick system operates by drawing up nutrient solutions from the reservoir to the plants through the capillary movement like a wick into the growing medium. And suitable choices of the medium include coconut fiber, perlite, or vermiculite. The downside is that because the wick isn't able to produce a strong stream of water, and nutrient solution, it is only ideal for smaller plants, and non-fruiting ones, like lettuce and herbs. Also, the system tends to keep the growing medium wet. Getting too much moisture makes the oxygen absorbing activities of the plant roots become harder. The wick system is not the most effective way to hydroponic plants. Not suitable for plants with a long growing period. DWC is an active recovery system, so there are moving parts. Of all active system of hydroponic growing, this is the simplest. All you need is a net pot, a reservoir/container, a lid, and a pump. Plants will be grown in a net pot with some growing media. They are placed and held by the lid on the top of the reservoir/container. Roots grow out the net pot and reach the nutrient solution held in the reservoir below. An air pump helps oxygenate the water and let roots breathe. In order words, this system work by immersing plant's roots directly into the nutrient solution of the reservoir that is highly oxygenated. The cons of this system are that it does not work well with large, and long-growing plants. Very few plants other than lettuce thrive in this system. Also known as Flood & Drain. The system floods the nutrient solution onto the grow tray to surround plant roots before draining back. Often automated by a pump connected to a timer. Require lots of growing media. So need proper knowledge. The active and recovery type is less commonly seen, but still quite effective. How this system works is basically like the way it sounds. Nutrient solutions are flooded onto the plant root system and then drain periodically. And the process goes on. Plants are grown in a tray/container with a growing medium. A timer is scheduled to turn on the pump, which pushes water with nutrient solutions in a reservoir below to rise through the tube and onto the main part of the system. 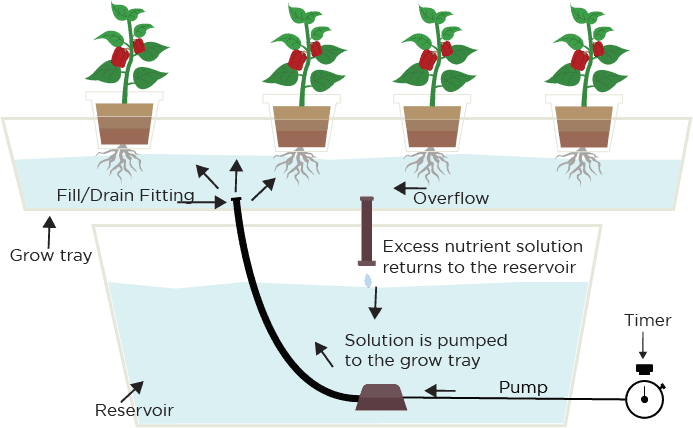 After the tray/container is filled (flooded) and soaks the plant roots at set intervals and water level, gravity automatically drains the solution back down into the reservoir. With this system, a variety of growing medium can be used, e.g., gravel, granular Rockwool, grow rocks, perlite, etc depending on Hydroponic gardeners' choice. However, there is a risk of power outages, or pump and timer failure, which causes the root dryness, and water cycles are stopped. Little to none growing medium used. Not suitable for large, heavy plants. This active and recovery system is a very common hydroponic one which has been used by lots of gardeners for commercial growing. Again, N.F.T uses the submersible pump and reusable nutrient solutions. It works by constantly flowing the solutions, so no timer is used. The nutrient is pumped into the growing tray (or a tube) and delivered to the root systems of the plants. Once the flow reaches the channel's end, it drains back to the reservoir through the slight downward tube. The roots suspended above the water level, are constantly moisture and get plenty of oxygen from the air surrounding them. 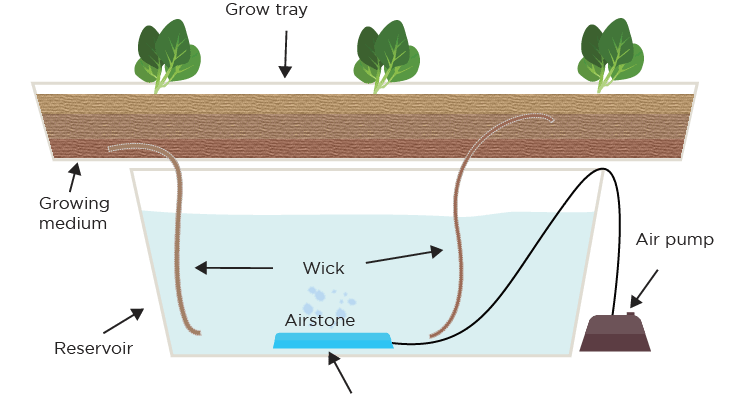 To provide oxygen in the water, and the grow tube, air stones or capillary matting must be placed in the reservoir. This also helps keep the system run for long without manually and frequently checking. Since no growing medium is used, plants are usually held in a grow-basket or a supporting collar. And because there is no growing medium to hold moisture, an extended period of interruption of the nutrient solution can make the roots dry, and plants' death. Drip system pumps the nutrient solution through the tube and drops onto plant roots via a network of drip lines. The action is often made automatical by a timer. Simple to build and use. Drip systems can be active recovery or non-recovery type system. They are among the most common types of hydroponic systems in the world, especially for commercial growers. The main principles behind the system are quite simple yet effective, and so their popularity. A timer is set to schedule the submerged pump. When the timer is on, the nutrient solution is pumped and dripped onto plants' base through a small drip line. And with this line emitter for each plant, gardeners can adjust the amount of solution per plant they want. 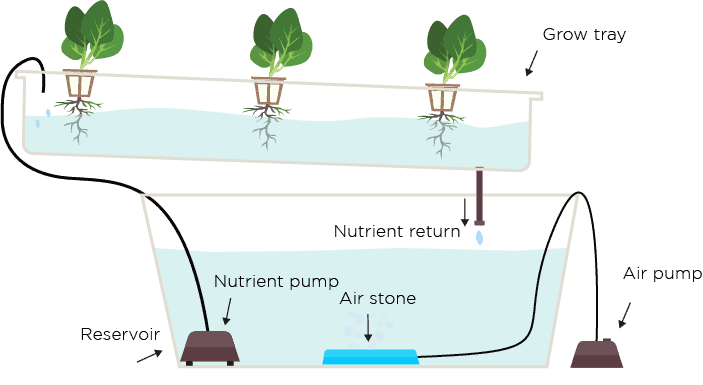 In a recovery drip system, the nutrient solution is sent back to the reservoir via the drip tray. Meanwhile, the non-recovery system doesn't collect the leach-out, which is not efficient, and this is only often used in the early days of hydroponics. However, while the recovery one can be more efficiently, and cost-effective by reusing the excess solution, non-recovery one needs less maintenance due to the same reason that solution is not recycled, and hence pH of the reservoir is not affected. By this, gardeners can mix pH adjusted nutrient solution in the reservoir, and forget all about it, until they want to fill more. Meanwhile, with recovery, hydroponic gardeners need to check pH regularly. The downside of the drippers/emitters system is the clogging, which is formed by the particles from nutrients that accumulated in the emitter. Plant roots are suspended in the air and are misted with the nutrient solution continously. The misting interval is fairly short, done by a pump controlled by a timer. Plenty of oxygen for plant roots. Aeroponic system is probably the most high-tech type of the six listed. Just like the N.F.C system, the plant roots hang freely in the air, with no growing medium used. 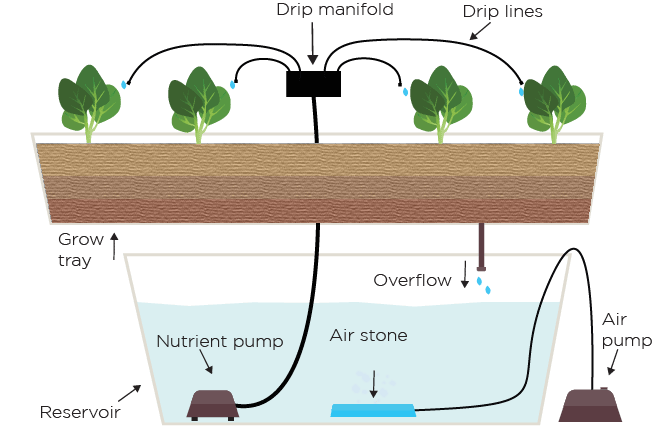 But in Aeroponics, the nutrient solution is pumped and sprayed onto the root systems constantly instead of flowing through a thin film of nutrient by a channel. 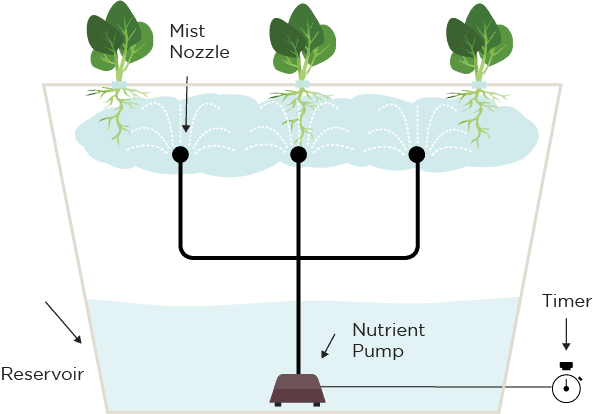 A timer is used to control the nutrient pump, but the cycle is much shorter compared to other hydroponic types. Typically, it is a few minutes between each misting interval. Again, since the roots are exposed to the air, the roots will be dried out fast in case of a misting cycle interruption. And this system is not as cheap, and easy to set up as other types. Plants are placed in a net pot, hung by a floating platform. Parts of the roots are submerged in the water while the rest are exposed to the air. Over time, when plants grow, the water level reduces, leaving an air zone for plant roots. A hands-off system. Not efficient for large systems. 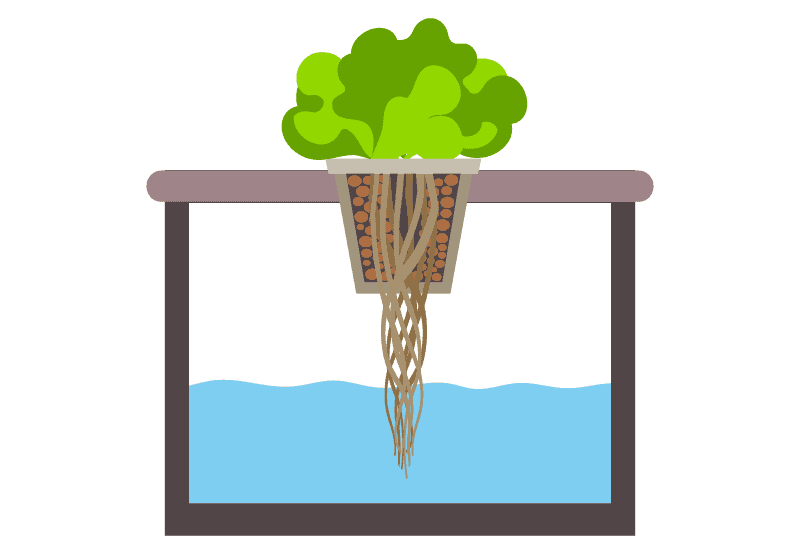 The Kratky method is just a variation of the Deep Water Culture. What is different is that the Kratky does not use electricity to run. So no pump, no timer needed. When the reservoir runs out of the water, your plants also have reached the end of their growth phase. Otherwise, you can fill with water and nutrient solution, and allow plants continue to its growth phase. So in theory, the Kratky requires little care. It also does not cost much. That makes it one of the easiest system to set up, which is highly suited for starters, hobbyists, and children. An aeroponics variation. 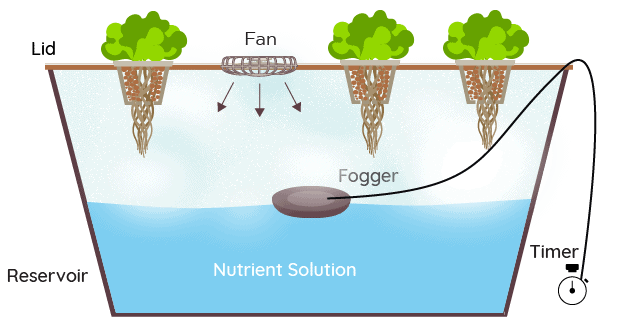 A fogger, which can be connected to a timer, is used to transform water and added nutrients of the reservoir into super tiny small droplets (or fog). Plants roots are hung freely in the air with plenty access to oxygen. They get moisture and nutrient via the wet atmosphere of the fog. The so-called fog is just the humid environment produced by the foggers. Fogponics is an advanced form of aeroponics. If in aeroponics, growers use the water misting to provide water and nutrients for plants, in fogponics, the foggers are used. Because the way it works, fogponis is fairly suitable for growing many types of plants like green vegs, herbs, and especially seedlings, and cutting cloners. The fogponics also comes with some downsides, including certain initial investment, built up salt from the fogger, and they are quite vulnerable to the power outages. Diseases can spread fast if they occur in the reservoir. Dutch Bucket, or Bato Bucket system is no doubt one of the most versatile hydroponic methods used to grow various plants by hobbyists as well greenhouse farmers. The most common plant grown is tomatoes, which are very suited for this system because it is built to accommodate large, vining plants. The system can be recirculated or non-recirculating depending on how growers want to set up. If you want to save the water and nutrients, a drain line can be connected with the buckets with its end pointed to the reservoir. One disadvantage of the recirculating system is it can cause nutrient unbalance over time. So you should replace the nutrient in the reservoir often. The Dutch bucket can vary in designs with the number of buckets used; types of buckets growing media, pipes chosen. But it all operates like the ebb and flow (flood and drain method). Overall, this is an interesting and effective hydroponic system that any beginner and seasoned hydroponic grower should try with. Excellent article and infographic, thank you.